It says: most kills 30 as a scout and I did it on the 3. may on the pulp server. However, the pulp server shows that my topstreak is only 21!!!! Re: No new topstreak granted? Yes when the valve update/sourcemod fiasco occurred the topstreak info was lost. We were not able to retrieve the older information so all info was started fresh just a few days ago. I know that. I've got a 21 killstreak after the reset, and THEN I got a 30 killstreak. Cake, i looked into the killstreak database and your 30 streak isn't there. I also looked into the errorlogs but there were no errors regarding the killstreak plugin. There are some errors that are related to maprate plugin (the one that asks you to rate the map) which also uses a database (but in another location), i don't think that is related. Next step i went through the serverlog that registers all the kills. If i wanted i could count your kills in there but i would have to know roughly the time on wich your streak started, do you have that info? Uhh... No not really, I was playing like the whole day I guess . Don't mind the issue that it isn't registered, I'll do it anytime soon again or even improve it so don't worry. I just wanted to report that the system was acting weird. So topstreaks will only be written if there are 10 players or more ingame. I guess this was done to prevent two players entering the server and killing eachother 100 times to get insane streaks. Shall we lower it to 6 or 8? I think there are more people who think the same. Thanks anyway. Don't feed the topstreak monster. Rank's bad enough to keep people defensive ALL OF THE TIME and to have teams HIDE IN SPAWN when their last point's being capped, topstreak does the same thing. 'Cause you'll totally headshot the 5 people on Point 5, or you'll actually be effective heavy minigunning from there...sheesh. Ooh lol. 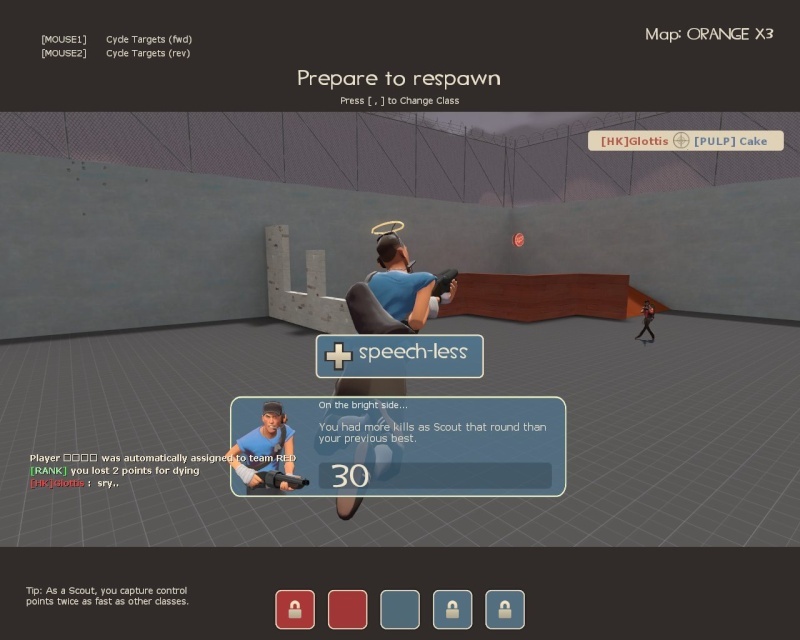 I always go demo and rush in with my eyedeleter and bash em all. But I guess it's true.